In a talk with Arutz Sheva, Rabbi of the prison service Rabbi Yehuda Weisner described preparations underway for the Passover holiday in Israeli prisons, where prisoners are soon to sit down to the Passover eve “seder” ceremony without friends and under lock and key - as they try to feel like free men in the spirit of the holiday. 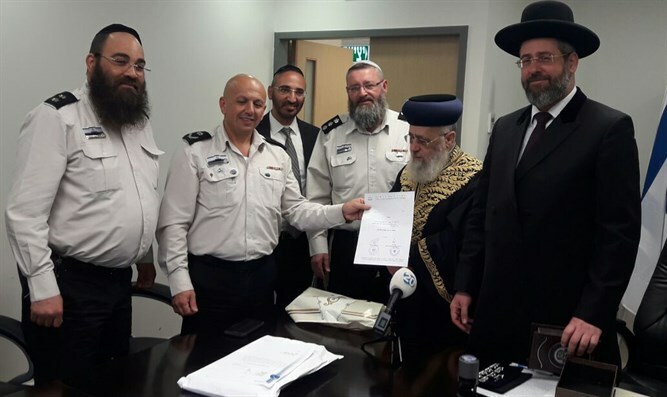 “Operation Passover” for the prison service began already the day after the Purim holiday a month ago. Rabbi Weisner described the complicated logistical preparations and brought up the fact that the prisoners cannot buy special products for Passover aside from those given as options at the “canteen,” therefore it is the responsibility of the rabbis of the prison service to supply matzah, wine, haroset and the like for the seder and the days of Passover that follow. “Unfortunately - or maybe fortunately - there are a large number of prisoners who keep the Torah and its commandments. I am happy that I can provide service, unfortunately it is in this sad situation behind the walls of the jail,” Rabbi Weisner said. The military rabbinate has reservists and “hesder” soldiers helping them make IDF kitchens kosher for Passover and leading the Passover seder. What happens in the prison service? What special requests have you encountered on the last days before Passover? Rabbi Weisner, formerly the Rabbi of Central Command, said that “during holidays its very hard on the spirit to be in jail, and during Passover it is doubly hard. During the holiday of freedom you’re sitting in jail and your children and family aren’t with you. It’s a very hard situation. When you sit with prisoners and talk with them, what do you tell them to encourage them? Around the seder table, prisoners succeed in being happy? “I think that there is some sadness somewhere at the bottom of their hearts. Some of them show it more, but I believe that most of the people try to say ‘if we’re already here, let’s make it nice and not cause ourselves to fall’ It really works differently for each individual.